LONDON--(BUSINESS WIRE)--Technavio market research analysts forecast the global patient warming devices market to grow at a CAGR of more than 7% during the forecast period, according to their latest report. The market study covers the present scenario and growth prospects of the global patient warming devices market for 2017-2021. The report also lists systems, and surface warming devices and accessories as the two major product segments. Systems are a one-time-investment while surface warming devices are reusable or disposable devices including mattress and blankets and accessories such as IV tubes, injection ports, and batteries. The high cost of disposable surface warmers and accessories is expected to have a positive impact on the growth of the market. Hypothermia is a potentially fatal, emergency situation that presents with symptoms such as confusion, loss of fine motor skills, and amnesia. Without adequate rewarming, continued heat loss can result in hypotension, impaired respiration, cardiac arrhythmia, and death. The common causes of hypothermia include medical conditions, exposure to extreme cold, age, and medical complications in physical trauma and surgical patients. Hypothermia is also a common occurrence in unwarmed surgical patients under anesthesia which can result in major complications. The anesthetic agent reduces the patient's metabolism and thermoregulatory system which will increase the prevalence of hypothermia. Blood transfusion is a common life-saving procedure during emergency treatments and surgeries as well as in the case of loss of blood due to severe injury. In 2013, the CDC estimated that five million patients undergo blood transfusion annually in the US. During blood transfusion, the blood needs to be warmed using a fluid or blood warmer to avoid complications. Blood and fluid warming devices are used surgeries to prevent hypothermia. Another driver influencing the growth of the patient warming devices market is the increasing incidence of thyroid and diabetes. Hypothermia is a sign of hypoglycemia as low blood sugar levels can damage the nerves that help regulate the body temperature. Similarly, hypothyroidism can impair the body’s ability to thermoregulate and affects the core body temperature. In 2016, 29 million US adults were estimated to have diabetes. “Due to the rising prevalence of diabetes, CDC launched programs and initiatives like Diabetes State and Local Program, National Diabetes Prevention Program, and National Diabetes Education Program to reduce the incidence of diabetes using a combination of scientifically proven, cost-effective, and scalable intervention and prevention strategies,” says Srinivas. 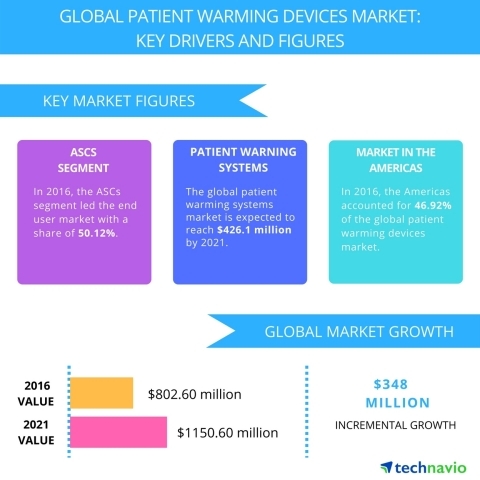 Technavio market research analysts forecast the global patient warming devices market to grow at a CAGR of more than 7% during the period, 2017-2021.